Big E has been feeling under the weather the past few days. This morning he awoke with a wheezing that wasn't sitting well with me. I called his doctor's office and when I described the wheezing they told me to bring him in ASAP. I threw the Yoys in the car. No drinks. No snacks. Nothing. They ushered us into Dr. Yoy at record speed. After a thorough inspection, Dr. Yoy diagnosed Big E with croup. Big E has never had the pleasure of experiencing croup, but Little E and croup are best friends forever. In fact, I expect Little E and croup to make their reacquaintance in the next 3-5 days. It will be epic. Anyway, Dr. Yoy decided to give Big E some oral steroids to help with the wheezing. After thinking about it for a minute, she decided to give him a steroid shot to speed up the absorption. This is when things went from sick kid to scary-as-sh*t-sick kid. The nurse had him lay down and gave him the shot in his thigh. Like any other kid, Big E is not a fan of shots. I DON'T WANT TO BE SICK ANYMORE! The nurse left the room and I went to work on calming Big E down. He climbed onto me and began thrashing around. He was barely audible, as part of his illness is hoarseness, but I could read the panic being emitted from his eyes. He arched his back, almost like he was seizing. He was gasping for air. Um, I'm no doctor, but this didn't seem kosher to me. I yell into the hall. OH MY GOD, HE'S TURNING BLUE! She yells for Dr. Yoy. The panic in her voice resonates in my bones. My poor Big E. He is back on the table. Dr. Yoy is administering oxygen and some breathing treatment. I am shaking, although I'm trying not to panic for the boys' sake. Little E is oblivious. He is laying on the cool, ebola infected tile of the room, sucking his thumb. Hey Little E, maybe next next time you should try Walmart. I hear their floors are cleaner. Big E fell in and out of sleep while he was hooked up to the machine. The nurse wrapped him up in a towel to try and stop the shaking. After Big E's oxygen levels came back up, Dr. Yoy decided it was time to transfer him to Scottish Rite. And she wanted him monitored on the way over. CAN YOU SAY AMBULANCE RIDE? Normally, Big E would have been amped. He LOVES emergency vehicles. But today he was scared. And it was so, so sad watching as the paramedics lifted his little body onto the stretcher all hooked up to machines. I'm happy to report that Big E was discharged from the hospital this afternoon with just some additional steroid medicine. 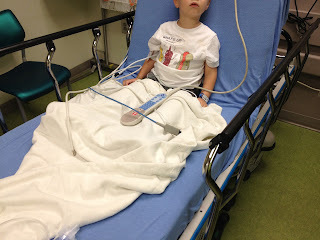 His wheezing all but stopped while we were at the hospital. I'm to keep a close watch on him tonight, which will mean I will sit next to his bed and watch him breathe for the next 11 hours. His wheezing ramped up again a few hours ago, so I'm very nervous. I talked to Dr. Yoy this evening. She said in all her years of being a pediatrician, today's visit was the scariest thing she's ever experienced in her office. So, do we get a prize for that? Special thanks to Uncle Yoy for coming to get Little E before he picked up any additional viruses and Aunt Yoy for watching him while we were at the hospital. I'm praying tomorrow morning Big E will be all sunshines and rainbows again.